This paper describes an automated method for finding clusters of interconnected proteins in protein interaction networks and retrieving protein annotations associated with these clusters. Protein interaction graphs were separated into subgraphs of interconnected proteins, using the JUNG implementation of Girvan and Newman's Edge-Betweenness algorithm. Functions were sought for these subgraphs by detecting significant correlations with the distribution of Gene Ontology terms which had been used to annotate the proteins within each cluster. The method was implemented using freely available software (JUNG and the R statistical package). Protein clusters with significant correlations to functional annotations could be identified and included groups of proteins know to cooperate in cell metabolism. The method appears to be resilient against the presence of false positive interactions. This method provides a useful tool for rapid screening of small to medium size protein interaction datasets. 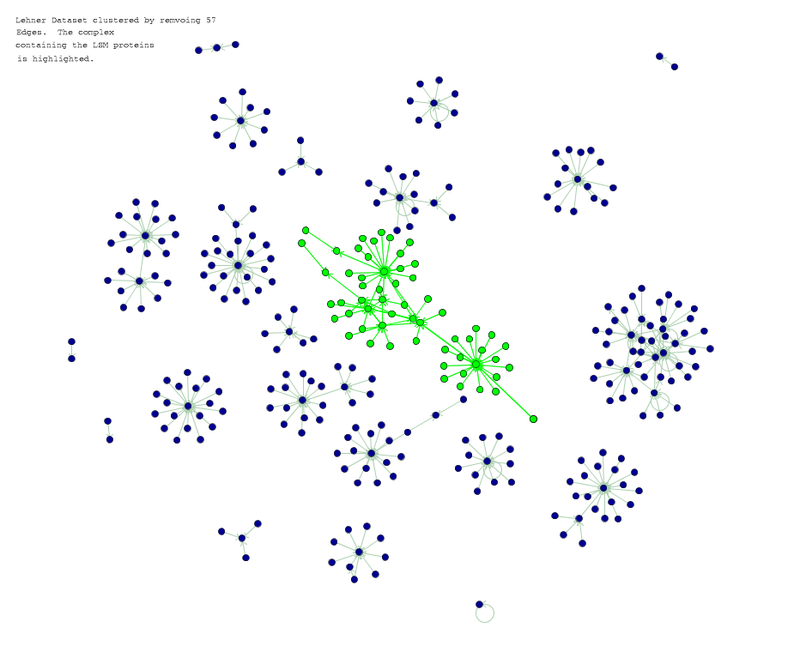 Protein interaction datasets are typically presented as graphs (or networks), in which the nodes are proteins and the edges represent the interactions between the proteins. These graphs can be used to investigate the functions of unannotated proteins through their interactions with neighbouring annotated proteins. Protein interaction datasets frequently contain many false positives and false negatives, (Bader et al , von Mering et al ) but studies have shown that true positives are frequently associated with areas where there are many interactions between neighbours (clusters). For example Giot et al  used independent datasets to remove false positives from a large-scale protein interaction dataset and as a result were able to demonstrate that true positives had a strong positive correlation with the clusters. Spirin and Mirney  found that clusters of highly interconnected proteins are significant features of protein interaction networks. These could not have occurred by chance and are therefore likely to represent groups of proteins that have co-evolved to serve a common biological function. Identification of clusters is therefore likely to capture the biologically meaningful interactions in large scale datasets. We applied the edge-betweenness method to a set of human protein interactions from our laboratory [12, 13]. In these experiments interactions were identified using the Y2H method. For comparison, two datasets of yeast protein interactions [14, 15] were also analysed. One yeast dataset also used the Y2H method  whereas the other was prepared using affinity purification . The functions identified for clusters by the automatic method were compared with the expert biologists' interpretations presented in these papers. The three datasets used differ in content, purpose, size, structure and species. A more detailed description of each dataset is given in the 'Methods' section and in Table 1, but briefly, the Gavin and Uetz datasets were large scale screens of the yeast proteome, not focused on particular metabolic pathways, whereas the Lehner dataset is focused on a few metabolic areas/complexes related to the human MHC class III region. While Lehner and Uetz both used the Y2H method to detect protein-protein interactions, Gavin used a combination of affinity purification and mass-spectroscopy. The two yeast datasets (Gavin and Uetz) have approximately 5× more nodes than the Lehner dataset. Whilst the Gavin and Uetz datasets have roughly the same number of nodes, the Gavin (affinity purification) dataset has twice as many edges (3145 vs 1498) as the Uetz (Y2H) dataset. The affinity purification method (Gavin) retrieves fairly stable complexes of proteins whereas the Y2H method detects direct protein-protein interactions which may be weak or transient. Datasets used for analysis Numbers of nodes and edges in each of the datasets used and a brief description of the methods used to generate the datasets. Mass screen of yeast protein interactions using Y2H  (Note 1). From Tables 2 and 3 it can be seen that the affinity purification dataset gives much bigger clusters with the removal of a similar proportion of edges, when compared to the Y2H datasets. When 15% of edges were removed from the Gavin dataset, the clusters (with more than one member) had an average of 23 nodes whilst for Uetz the average was just over 7 nodes. The Lehner dataset fell between these values. Diagrams showing the Lehner dataset before and after clustering are presented in Additional files 11 and 12.
range of cluster sizes The distribution of cluster sizes in 3 datasets, after clustering with different numbers of edges removed. cluster characteristics The average cluster size, number of clusters and other properties of the dataset, after clustering with different numbers of edges removed. The choice of the number of edges removed needs to be guided by the dataset and problem under consideration. A number of criterion could be used. (i) Range of cluster sizes: To decide what a sensible distribution of cluster sizes would be, the range of sizes of clusters found by affinity purification was used as a guide. Gavin  reported the distribution of cluster sizes as follows:-51% had 1–5 nodes, 18% 6–10 nodes, 15% 11–20 nodes, 6% 21–30 nodes, 4% 31–40 nodes, and 6% > 40 nodes. In order to emulate this type of distribution with the automatic clustering (see Table 2) it is necessary to remove more than 13% of edges from the Uetz and Lehner datasets and more than 25% from the Gavin dataset. Therefore it is necessary to remove a much higher proportion of edges from the affinity purification dataset. cluster quality Association between the size of the clusters and the quality and quantity of significant GO terms with different numbers of edges removed. The data above shows that most of these criteria give similar results and suggest that the method used to produce the data (Y2H or affinity purification) will be a major determinant of the proportion of edges to remove. To summarise, for Y2H, useful results are obtained by removing 10%–15% of edges whereas for affinity purification, removing 25% edges gives better results. Newman and Girvan  have developed methods for assessing the 'modularity' of the clusters produced by edge-betweenness clustering. It would also be possible to use methods of this type, as a more objective way of deciding how many edges to remove in different datasets. Size of cluster is important, because the quantity of significant annotation information i.e. the average number of significant GO terms per protein, (Table 4) increased, for all datasets, as cluster size decreased. However the detail of the information, measured as average depth of GO per node, did not change with cluster size. It is noticeable that human proteins in the Lehner dataset [12, 13] had been annotated to a greater level of detail (average depth of nearly 6 in the GO hierarchy) than the yeast proteins (average dept of approx 4.7, see Table 4) and whereas virtually all of the clusters in the Lehner dataset had a correlation with at least one GO term there were many clusters in the yeast dataset which had no significant GO terms (the majority in the case of the Uetz dataset). This could be a peculiarity of the metabolic areas chosen for the Lehner study. The utility of this approach is currently restricted by the size of the dataset being analysed, especially when a large number of edges are being removed. For the Gavin dataset, when 57 edges were removed the total time to cluster was 1 h 25 min but when removing 1500 edges it took 10 h 10 min. According to the software documentation  and as discussed by Newman  the running time for sparse graphs (such as these) is proportional to both the number of edges removed and the total number of nodes. The Ito dataset (see below) took >>24 h when > 500 edges were removed. This method is therefore of greater utility for small to medium datasets, having less than 2000 nodes or edges. After performing the Chi Squared tests and checking them against a random reallocation of GO terms across the network, all the significant GO cluster correlations remained significant. In no case were more than 5% of the lowest p values of the randomly reallocated GO terms lower than the lowest p value in the original dataset. In almost every case the significant annotations were informative about a potential function for the clusters (see Table 5), providing distinctive groupings of annotations which distinguished different functions for the different clusters (the aim of the method). It was often a very small proportion of the proteins which provided the annotations which were used to characterise the cluster, (Table 5 and Additional Files 1, 2, 3, 4, 5, 6, 7, 8, 9, 10, which provide complete sets of clustering results and details of the proteins which contributed the significant annotation). significant GO terms for the Lehner dataset A selection of GO terms with significant correlations to the 20 clusters in the Lehner dataset, clustered by removing 57 edges. (The numbers after the descriptions show the proportion of proteins in the cluster which were annotated with that GO term). The complete set of GO terms for each of these clusters can be seen in Additional file 7 and the identity of the transcripts associated with the significant GO terms can be found in Additional file 8. One test of this method was to determine whether the clusters generated and the associated GO terms corresponded to clusters previously identified by expert biologists. When edge-betweenness clustering was used to remove 57 edges, 21 clusters (with size greater than one) were created (Table 3). From Table 5 (and from the more detailed information in Additional file 7), it can be seen that these clusters differ in the significant GO terms associated with them i.e. the method does separate groups of proteins with different metabolic functions. Significantly, clusters were generated with functions corresponding to all of the metabolic areas identified by informed biological interpretation. These were transcription (cluster 9), ubiquination (cluster 15), cell cycle reg (cluster 14) and mRNA processing (cluster 21, cluster 3, cluster 6) Only one cluster, cluster 10, had a description ("biological process") which was too general to give useful information about function. However when this cluster was broken down further (in the test with 100 edges removed) more informative terms ("response to abiotic stimulus", "eukaryotic translation elongation factor 1 complex") were associated with the new, smaller parts of the cluster. Interestingly cluster 10 contained very few proteins with GO terms assigned to them and therefore may represent an under-investigated module in the human proteome. This highlights the dependence of this method on the quality (depth) and quantity of the GO annotations available. This was good for the H.sapiens proteins but less good for the yeast proteins. One important question is whether the functions identified for these protein clusters are confirmed by biological experimentation. The Lsm complex is mentioned by the authors of all 3 papers [13–15], It has been extensively studied in both yeast and human . The Lsm complex has been shown to have a number of functions related to RNA processing, including the splicing of nuclear pre-mRNA and the decapping of cytoplasmic mRNA prior to degradation. In the Lehner dataset two GO terms, GO:6371 "mRNA splicing" and GO:8380 "RNA splicing", were always associated with only one cluster in the dataset. This was a good candidate for the Lsm complex. Of the 8 Lsm proteins examined in , all eight were found in the cluster associated with these two GO terms for the tests when 10, 30 and 57 edges were removed. A diagram showing the cluster containing these proteins, in the dataset with 57 edges removed, can be seen in Additional file 13. When 100 edges were removed, the cluster labeled as RNA splicing contained 5/8 of the Lsm proteins. The three clusters containing the other 3 proteins had the following significant descriptions (the number in parenthesis shows; the number of proteins with this annotation / the total number of proteins in the cluster). For the Lehner data, when 15, 30 and 57 edges were removed, the clusters labeled as being associated with RNA splicing are large containing 190, 143 and 60 proteins respectively (see below). The cluster with 5/8 Lsm proteins (100 edges removed) had only 17 proteins. In addition to the Lsm proteins the large clusters contained other proteins known (i.e. having GO labels) to be involved in RNA splicing. The proportions are shown in Table 13. This data clearly shows that as the cluster size gets smaller, the cluster is more focused round the RNA splicing function. Larger clusters must have sub-clusters related to other functions. The last column in the table above shows that many of the RNA splicing proteins grouped in these clusters were the prey of the Lsm proteins in the original experiments , which is what we hoped this method would achieve. Therefore for the Lehner data, the cluster identified by Edge-Betweenness clustering as the "RNA splicing" cluster, did contain the proteins expected to be associated with this process. However this is a small dataset focused around a specific biological process. A more stringent test of this method is provided by the yeast proteome datasets where screening was not functionally focused. Gavin et al  and Uetz et al  both describe the Lsm complex. One complication in both of these datasets, is that the yeast proteins are not annotated to the same level of detail as the human proteins. For example there is no annotation for "RNA splicing" but only the higher level GO term GO:16070 "RNA metabolism", which covers a much broader range of cellular processes. In Gavin et al , the Lsm proteins are found in the complex described as TAP-C128. This contained 36 proteins. The distribution of the TAP-C128 proteins between the clusters are shown in Table 6. It can be seen that a minimum of 6/7 Lsm proteins and proteins associated with RNA metabolism are clustered together, at all numbers of edges removed. the distribution of proteins associated with RNA metabolism from TAP-C128 The number of proteins from TAP-C128  which cluster together when different numbers of edges are removed and also the proportions which are annotated for RNA metabolism. Therefore in a dataset not focused round RNA metabolism, the edge-betweenness algorithm successfully clustered the Lsm proteins with a number of other proteins that were co-purified in the TAP-C128 complex and a cluster produced using the graph topology was shown to correspond to a cluster of known function. 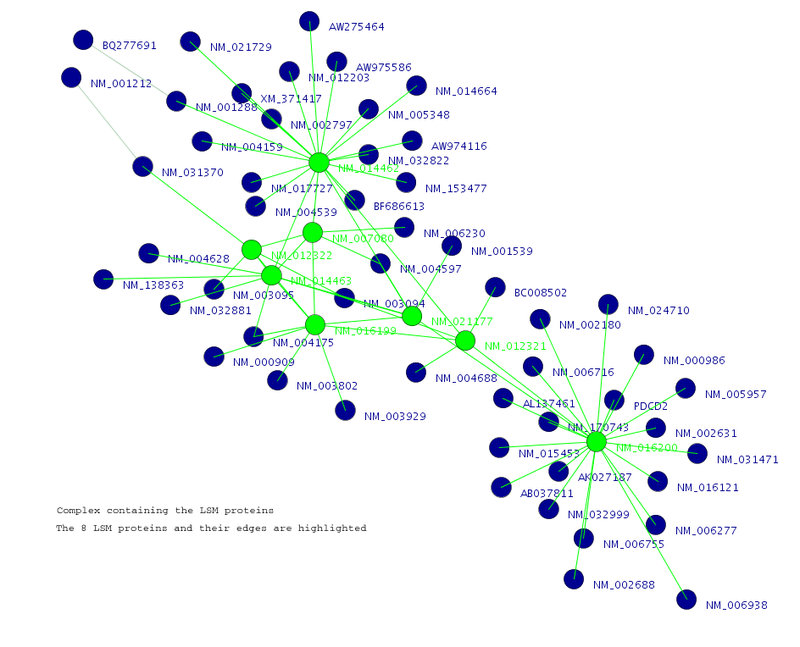 In Uetz et al 2000 , the Lsm complex is described as a set of 16 interacting proteins. The one cluster containing all of these proteins does not correlate with the GO term for "RNA metabolism" in the datasets with 30 or 57 edges removed. This correlation only emerged once 100 edges had been removed. With 400 edges removed 11/16 are still in the same "RNA metabolism" cluster (the other 5 are spread between 5 different clusters). Therefore in the Uetz dataset although all the Lsm proteins clustered together, it was only once more than 10% of edges had been removed that it was possible to get a significant association with the relevant GO term. Finding the correct number of edges to remove is obviously essential to extracting the required information. Overall it can be seen that the method is capable of finding clusters of proteins with known biological function and of correctly assigning a relevant annotation to a particular group. In Gavin et al  the authors discuss two clusters which are described as "stable and "transient". TAP-C162 is an example of a "stable" complex which was always isolated with the same members. It is part of the poly-adenylation machinery. In contrast, TAP-C151, the "transient" complex was frequently isolated with different components. It is a signaling complex formed around protein phosphatase 2a. The distribution of these two complexes between the clusters generated by edge-betweenness clustering, was compared at different levels of clustering, (see Tables 7 and 8). While TAP-C162 remains mainly associated with one cluster at all numbers of edges removed, TAP-C151 becomes distributed much more evenly between a greater number of clusters. Therefore it seems likely that the method described here favours the detection of more stable clusters, as the number of edges removed increases. Clustering the Lehner dataset with added false positive edges (see "Methods" section and Table 9) gave no obvious difference in cluster size (Tables 10 and 11) or quality or quantity of GO annotation (Table 12). The dataset with false positives is slightly larger than the original dataset, but this did not change the number of clusters. The slight increase in average cluster size led to a commensurately small fall in annotation quality (GO per node), but there were no dramatic differences in cluster size distribution or any of the other measurements. Clustering of RNA splicing proteins in the Lehner dataset with different numbers of edges removed. Fourteen out of twenty-one of the clusters in the original dataset remained completely intact, and even when this was not the case a minimum of 70% of the original proteins in the other clusters could still be found together in one of the new clusters. Therefore adding the false positives did not render any of the original clusters unrecognisable. When the dataset with the false positive edges removed was compared to the dataset with the same number of edges removed at random, the differences were more marked. The dataset where edges were removed at random had smaller clusters (Tables 10 and 11) and more single nodes (Table 11 last column). The identity of the clusters was perturbed to a greater extent. Further analysis showed that when the false positives were removed 12/21 clusters still remained completely intact. With removal of random edges only 4/21 clusters were completely intact. However even in this dataset 14/21 clusters had 80% of proteins from the original clusters co-occurring i.e. 3/4 of clusters were still recognisable. Randomly removed edges can be considered to be false negatives and so the method is also showing good tolerance to false negatives, and can still preserve a good level of cluster identity. Overall, even though the false negatives reduce the average sizes of the clusters and splits off many single nodes (as would be expected because nodes with single edges are much more abundant than nodes with multiple edges, in Y2H datasets) the same clusters are still being found 75% of the time. In other words the presence of false positives and false negatives in the dataset does not seem to distort the composition of the clusters created by the Edge-Betweenness method in a way that obliterates cluster identity. But false negatives do appear to have a slightly more detrimental effect than false positives. Looking at the edges which were removed during clustering, when 57 edges were removed (from the dataset containing false positive edges) 3/57 (5%) had false positive nodes at one or both ends. When clustering was done by removing 100 edges 15/100(15%) were attached to false positive nodes. This compares with 68/465(14.6%) edges attached to false positive nodes in the whole dataset. There is no obvious bias in the presence of false positive edges between or within clusters. Overall it appears that the clustering is fairly robust to the presence of false positives and also to the random removal of edges i.e. false negatives. With the Ito et al  dataset it was hard to say whether there was much effect from the removal of false positives or addition of false negatives, as the proportion of nodes and edges affected was so small, but again there were no obvious differences. Edge-Betweenness clustering can be used to separate protein interaction networks into clusters which have correlations with annotated gene functions. This can be done in an automated fashion and thus can provide a means of rapidly screening the results of protein interaction experiments. Clusters produced by this method contain groups of proteins which are known to cooperate to perform common functions, described by the correlating annotations. Therefore the clusters detected by this method correspond to active protein complexes found in the cell. Moreover the method worked for different types of dataset (Y2H and affinity purification) different organisms (yeast and human) and for datasets with a 5× difference in the number of edges. The smaller the clusters generated by this method, the higher the average number of significant annotations. The preliminary results presented here suggest that, in general, useful information was obtained once approximately 10% of edges were removed from Y2H datasets and a slightly higher proportion (25%) from affinity purification data. This method is particularly good at detecting "stable" clusters. The method is also flexible and can be adjusted according to the nature of the dataset and to the function being studied. Currently scaling to very large datasets when large numbers of edges need to be removed is problematic, but this may soon be alleviated by new developments of the algorithm . The level of detail and amount of available annotation will have a significant effect on the utility of this method although it is possible to tune the amount of annotation found by the method, by altering the number of edges removed. The amount of available annotation will increase as proteome annotation progresses. Spirin and Mirny  have demonstrated the robustness to false positives and negatives of various clustering methods (not including the Edge-Betweenness method used here). They found that 80% of clusters could still be detected if up to 20% of links were added or removed. Our results suggest that Edge-Betweenness clustering is similarly robust. This robustness is undoubtedly for the reason identified in  which is "the use of multiple interactions to identify a cluster", in other words the interconnectedness of a pair of proteins is reconfirmed by the interconnectedness of their neighbours. The biological significance of these interconnected sets of proteins was shown by the high correlation between true positive interactions and clusters in Drosophila protein interaction networks, found by Giot et al . Giot et al  also found that prey (but not bait) with a large number of neighbours had a significant negative correlation with the reliability of the interactions. These highly connected prey correspond to the promiscuous prey which we identified as false positives and which although highly connected do not have neighbours which are themselves highly interconnected. As this method appears robust to the presence of such proteins it is not necessary to "clean up" the datasets before using them. The hierarchical nature of the Gene Ontology made this a very useful system of annotation to exploit in this method. It allows proteins to be grouped according to the most detailed shared level of annotation but also enables higher level (less informative) annotation to be used when this is all that is available. The very high level terms which apply to almost all proteins are usually ignored as they are not concentrated in a particular cluster, although these terms occasionally appear as significant, in clusters with higher than average levels of annotation. Edge-Betweenness clustering provides a quick way of picking out functionally interesting areas of protein interaction datasets. It also appears to be robust against false positives and negatives. As such this approach can be applied to any quality of data. It also deals effectively with poorly connected nodes, such as the many prey with single connections found in Y2H graphs. Because the Edge-Betweenness algorithm does not scale well to larger graphs, this method is currently most appropriate for studies focused on specific areas of the proteome. However, modifications of the algorithm are being developed and these should allow it to be applied to larger datasets in the future . The implementation described here is particularly effective where good quality GO annotation is available, which is especially true for many human proteins. It will be a useful method for detecting functions for unannotated proteins based on the knowledge of the functions of their neighbours and for exploring functional modules within the proteome. The datasets used for analysis are described in Table 1. Briefly the Lehner dataset comes from our work on the function of the MHC class III region [12, 13] and is a small, highly focused dataset of H. sapiens protein interactions, detected using the Y2H method . The other datasets, Gavin  and Uetz , are larger datasets resulting from mass screens of the yeast proteome, using either Y2H (Uetz) or affinity purification (Gavin). The method presented here was developed for the Lehner dataset. In order to test the method, it was applied to the larger, less selective yeast datasets. The Ito dataset , an even larger yeast dataset, was included in order to test the effect of false positive proteins. This dataset contained 16 proteins identified by Gavin et al  as false positives. However it was not used for other aspects of the investigation as clustering takes a long time when large number of edges are removed. Thus the Ito dataset represents the upper limit of the size of datasets suitable for use with the method described here. The Gene Ontology (GO)  was used as the source of functional annotations. It was chosen because it provides hierarchically structured, controlled vocabularies. Genes or gene products may be labeled with terms from any level in any of the three hierarchies (ontologies). By searching up through the hierarchy, it was possible to find terms shared by proteins which had been initially labeled with different descriptions. The search through the hierarchy is easy to automate, which makes it possible to group together proteins participating in the same general functions, even when they were originally annotated for different, more specific functions. Transform the protein interaction data to GraphML (an XML format for graphs ), removing any parallel edges, to make the data ready for import into JUNG. Use the JUNG graph analysis framework  to cluster the data using the "Edge-Betweenness"  algorithm. Find GO terms and the parents of those GO terms for each GO annotated protein in every cluster. Test the association between each GO term and each cluster, from a 2 by 2 contingency table. Correct the association tests for multiple comparisons, using a permutation test with random re-allocation of GO terms to proteins. Generate reports on cluster size and significant GO terms. JUNG version 1.3  was used to cluster the graph by the Edge-Betweenness clustering method . This algorithm removed those edges which lay on routes between interconnected clusters. "Betweenness" is calculated by finding the shortest path(s) between a pair of vertexes and scoring each of the edges on this/these path(s) with the inverse value of the number of shortest paths. (So if there was only one path of the shortest length, each edge on it would score 1 and if there were 10 paths of that length, each edge would score 1/10.) This is done for every pair of vertexes. In this way each edge accumulates a "betweenness" score for the whole network. The network is separated into clusters by removing the edge with the highest "betweenness", then recalculating betweenness and repeating until the desired number of edges have been removed. The method is fully described in . The number of edges to remove was supplied as a parameter. Removing a larger number of edges reduced the size of the clusters produced. The number of edges removed was varied to see whether (a), clusters of certain sizes gave better correlations with GO terms and (b), whether datasets of different types cluster in different ways (likely, as the affinity purification dataset has approximately 3× as many edges as the Y2H dataset with a similar number of nodes). GO terms available for each of the proteins in the graph were retrieved. In the case of the Lehner dataset these were taken from the RefSeq records , for the Uetz and Gavin data these were provided by BIND . The Gene Ontology "termdb" release from December 2003 was used as the source of the parent GO terms . Tables to hold these GO data were set up using the PostgreSQL relational database management system  (version 7.3.4-RH). The parents of each GO term were found by using an adaptation of the sample query provided on the GO web site . This query was called from either perl scripts or Java programs, which allocated the terms to the clusters. The 'R' statistical package  (version R 1.8.1 (2003-11-21)) was used to perform the statistical analysis on the data retrieved. The association between each cluster and each GO term was tested using a 2 by 2 contingency table by Fisher's exact test. The GO terms (significant and non-significant) were redistributed across the clustered network at random. The p value was recalculated for each GO/cluster combination. This randomisation was repeated 1000 times. The overall significance was calculated as the proportion of randomisations in which the smallest p value for a GO-cluster association was less than or equal to the smallest p value in the original data. We considered the GO numbers to be significantly associated with the clusters if the overall significance was less than 5% (i.e. fewer than 50 of the 1000 randomisations' lowest p values were smaller than the smallest p value from the observed data). In order to compare the informativeness of the GO/cluster associations, the following ratios were calculated (a), the average number of GO terms per node in the clusters and (b), the average depth of the GO terms per node per cluster. These provided an indication of the 'quantity' and 'quality' of the GO information. A GO at a greater depth in the GO hierarchy provides more detailed information than one higher in the GO hierarchy. In our original experiments [12, 13] there were a number of prey that interacted with many different bait. Prey found by more than three different bait were defined as false positives (of the 'promiscuous' type). There were 14 of these (approximately 4% of the dataset nodes). 10 of these 14 had been excluded from the original data. 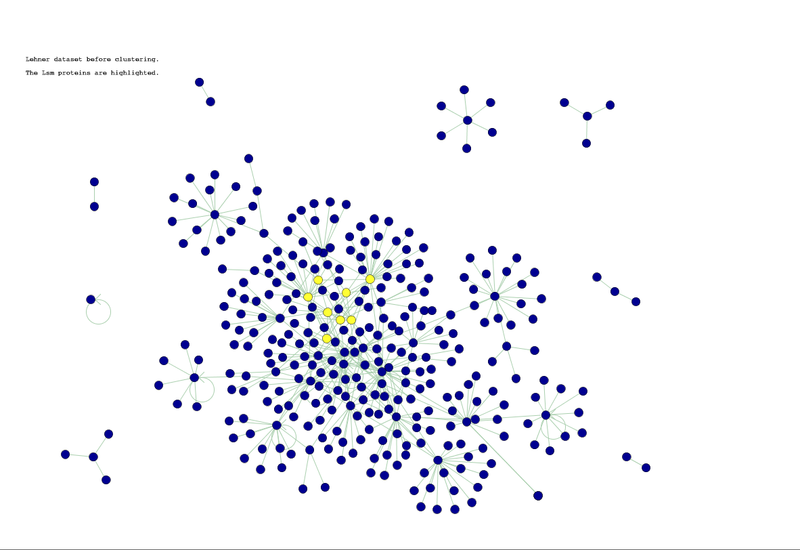 To investigate their effect on clustering, these nodes and all associated edges were added back to the data. This contributed 59 new edges to the dataset (13% of dataset edges). This dataset was clustered and the clusters compared to those found in the original experiment. If these nodes were disconnected this removed 68 edges, so nine of the edges connected to false positives were part of the original data. In a control experiment 68 edges were removed at random (from the dataset with false positives added), this dataset was clustered. This was repeated 100 times and the results were compared to the clusters obtained from the dataset which had false positive edges removed. All false positive datasets (see Table 9) and controls were clustered by removing 57 edges (a number chosen originally because it gave a tractable number of clusters of a reasonable size in the Lehner dataset). The work was funded by MRC Link Grant G0100814, in association with Genetix. FD is supported by European Commission grant 503485. We would like to thank Anton Enright for helpful comments during the revision of this manuscript. RD: analysis, interpretation and writing. FD: statistical analysis. CS: data acquisition and supervision.